1 x 7 strand nylon coated wire. The first blood red nylon coated wire. Available in 30lb & 45lb BS, 30' spools. If RED is not your thing and you feel you want the properties of this product but not the colour check out the SURFLON range. Available in 30lb & 40lb spools. Its clear and looks like bare wire. Slightly softer but still works a treat for trolling and up-trace material. Remember we were the first UK company to use this product. I’ve been using this product now for the last 5 years and must say I’m chuffed to bits with it. 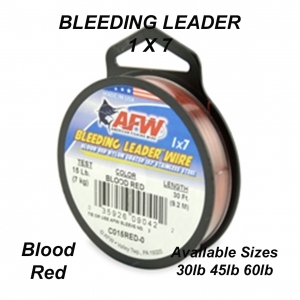 The 45lb Red coated wire is fairly stiff, but this is to its advantage. I have along with a lot of mates been using it for up traces and trolling rigs the reason for this is it’s stiffer than my main trace which inturn seems to eliminate tangles. "It keeps the baitin the position where it needs to be". On the paternoster rig a “Roberts” paternoster boom can be tied directly on the Red trace wire, the boom can be stopped with 2 of the small rubber line stops if you require no movement of the boom. Similarly the trolling rig can have a pear lead on the trace wire itself (although some people may not subscribe to this method), alternatively have the lead onto a rotten bottom in case of impending disaster. Can be twisted.......email for details!!!! !